Army Lt. Col. John Kilpatrick’s ascension through the ranks of two branches of the United States military can yield a half-dozen inspiring testimonials of service, determination and achievement. He spent 10 years in the Marines as a reservist, then joined the Army National Guard and earned his commission in 1998. He now commands a medical support unit in the Army Reserve. Over the last 31 years, he’s been deployed to Saudi Arabia, Kosovo and Kuwait and served an 18-month mobilization as a medical operations officer for the Office of the Surgeon General, Department of the Army, at the Pentagon. John Kilpatrick, center, poses for a photo with friend Robert Goler and VRR board member Dr. Reginald Eggleston after a presentation at Faith Baptist Church in Mobile on Veterans Day weekend. His substance abuse and path to recovery were previously invisible. And though he’s been in recovery for nearly 20 years, the path that Kilpatrick and others have taken to get there hasn’t been clear. Kilpatrick, who is currently pursuing a master’s degree in social work at The University of Alabama, is founder and executive director of Veterans Recovery Resources, a Mobile-based non-profit organization that will provide affordable substance abuse and mental wellness services to veterans and their families living along the Alabama Gulf Coast. While Mobile will be the first location, the goal is to share the model across the U.S. With 20 veterans committing suicide a day, the need is dire, Kilpatrick said. Kilpatrick’s experiences in medical operations and hospital administration have influenced the infrastructure of Veterans Recovery Resources, including its advisory board of veterans, marketing specialists, clinicians and lawyers from across the Gulf Coast, Birmingham and Atlanta. The community-based program is designed primarily by veterans hoping to remove financial and societal barriers to seeking and receiving care. Kilpatrick’s personal and professional experiences have also helped him shape a practical and sustainable business model, including establishing a unique by-veteran, for-veteran inpatient treatment facility that is self-sustaining at Veterans Affairs’ reimbursement rates and providing interventions to veterans whose substance abuse or mental health issues have led them to legal troubles. He, along with attorney and board member Ronald McBay, worked with Mobile County to establish a “veterans treatment court,” a diversion program for veterans whose non-violent offenses are related to substance abuse and mental health disorders. The first veterans court began in Buffalo, New York, in 2008, and there are currently 21 in Alabama. The Veterans Recovery Resources board is looking for a building to serve as its inpatient treatment facility, which will house approximately 20 beds. The outpatient program and ongoing fellowship program will also operate out of the new facility. “Our goal is to create a vibrant network of veterans who support each other over a lifetime. Recovery isn’t a one-and-done kind of thing,” said Kilpatrick. 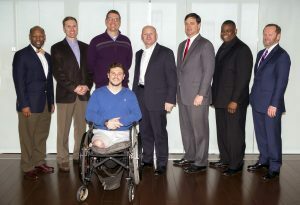 Kilpatrick and members of the Veterans Recovery Resources Board of Advisors. Kilpatrick is currently in his third semester of the Distance MSW program and hopes to apply clinical knowledge to eventually work directly with veterans in addiction. 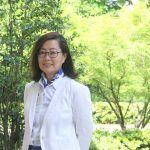 He weighed graduate programs in psychology, social work and other medical-related fields but ultimately chose social work because it would provide a base to one day create and influence policy. Kilpatrick said he chose UA’s program because of the local labs and the relationships and connections he could form within his cohort. Kilpatrick was familiar with his faculty adviser, Dr. David L. Albright, Hill Crest Foundation Endowed Chair in Mental Health and associate professor in UA’s School of Social Work, before enrolling at UA. 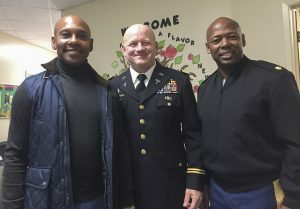 The two share military advocacy and health care connections on the Gulf Coast, which allows them to share ideas and experiences to serve veterans in the state, particularly in how social workers fit within the health care delivery system. Albright said Kilpatrick’s degree pursuit is vital to combining evidenced-based care practices with his 30-plus years of experience on the logistical and operational side of healthcare, and the “social worker-like” support he’s provided to fellow veterans in that span.